I find lots of interesting Web sites that are unrelated to baseball history, but which might be interesting to Pilots fans, because they relate to U.S. culture of the 1960s. Rather than change the focus of the main Links page, I've created this second page to share these sites with you. The Hat n' Boots, December 2001. The Hat's brim is 44 feet wide. 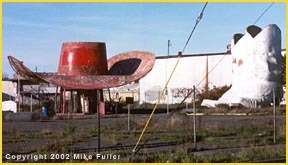 Hat n' Boots - Dedicated to preserving Seattle's Hat n' Boots: a former gas station built along old U.S. 99 (sister road to Route 66). With the Twin Teepees torn down, this is one of Washington's few remaining examples of vernacular architecture. Let's save it! Roadside Peek - A fabulous site that is full of retro/futuristic-looking bowling alleys, drive-ins, gas stations, motels, neon signs, tiki villages and the like. This site and TV Party are my most-recommended places on the Web! Seattle Hockey Homepage - Just about anything you'd want to know, from the 1917 Stanley Cup champion Seattle Metropolitans, to the Totems, to the Thunderbirds. A Seattle Lexicon - From the Aqua Follies to Wunda Wunda, everything you need to know about Seattle pop culture. There's even an entry for the Pilots! if you watched TV in the 1960s or 1970s, visit this site and you will swear you're in heaven! History Link - An incredible archive all about Northwest historyfrom the famous to the scandalous to the vanished. Remember the ABA - The red, white and blue ball, the 30-foot three-point line and Dr. J. in this prime. This site has uniform, pennant and logo galleries, complete stats, team histories, the all-time ABA team. Patio Culture - As its creator describes it, "The place where you grew up if you grew up in the suburban America of the 1960's." It re-creates the feel of that time better than any other similar site I've seen. The Space Station - Headquarters for Major Matt Masonone of the most popular toys of the 1960s. Sgt. Storm, Doug Davis, Jeff Long and Callisto, the friendly alien from Jupiter are all here with their cat tracs, jet packs and space sleds. Feeling Retro - It's a Saturday morning in the late 1960s. You've downed a bowl of Quake cereal, watched Underdog and played with your Rock Em Sock Em Robots. This site features some original content and a bunch of great '60s links.